(CNN) -- A recent scientific expedition in Colombia's mountainous Darien region has unearthed 10 new species of amphibians, an environmental organization said. 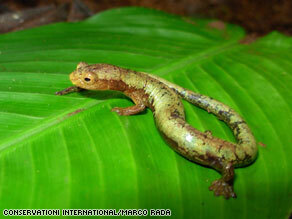 A new species of salamander was one of the exciting discoveries in Colombia's Darien region. Scientists with Conservation International on Monday announced the discovery of 10 new species in what's being referred to as a safe haven for frogs located in the west of the country on the border with Panama. The discovery of 10 amphibians, which are believed to be new to science, was the result of a three-week survey of the area, the group said. The new species were discovered as part of a CI program aimed at assessing the ecological health of a given area. Scientists identified nearly 60 species of amphibians, 20 reptiles and 120 species of birds, the group said in a prepared statement. The discoveries come as global extinction rates continue to rise. Experts with Conservation International argue that the discovery is particularly significant since amphibians serve as an accurate gauge of an area's ecological health. Amphibians can act as an early warning sign of pollution such as acid rain due to their porous, absorbent skin. The sensitivity of these species to low level environmental threats can also act as a barometer for human health. Conservation International says the discovery offered renewed optimism. "The high number of new amphibian species found is a sign of hope, even with the serious threat of extinction that this animal group faces in many other regions of the country and the world, " says Jose Vicente Rodriguez Mahecha, Scientific Director of CI-Colombia, who was part of the team that discovered the new species. The region is, however, not immune to modern threats. According to Conservation International, between 25 percent to 30 percent of the natural vegetation in the Darien area is currently being deforested. For the scientists, the hope now is that the discoveries will renew efforts to conserve the region and manage its rich biodiversity.